I recently had an inspiring conversation with someone who has had a long-standing interest in the Village. We talked about how fragile our world is on almost every front, from climate changes to economic melt-downs to rioting in the cities like London and Birmingham, to corruption in politics and big business. You all know the list. Then the conversation turned to preparation. Why do we want a self-sufficient lifestyle? We both agreed that it is totally impossible to prepare for every doomsday scenario. We do our best to be pragmatic about our preparations. We keep our eyes wide open. We try not to be in denial, but also not in hiding. In the end, none of us know what challenges may come our way or when. Meanwhile, we don’t want to over-react. Fear can ruin your life. It’s important that we continuously move towards something good, not just away from the things we fear may be bad. I often think of the life Henry David Thoreau, the great poet and philosopher, described in his landmark book, Walden Pond. He moved there, not to flee anything, but to move toward a more simple, peaceful, self-assured life. He wanted the freedom that comes from stripping away the bonds that come with having too many possessions. They tend to own you, rather than the other way around. He wanted the peace that comes from knowing that your life is not dependent on the whims of someone else, a job or the economy, or … whatever. And he proved it possible IF you strip away the unnecessary. Life without many of the things we had come to think of as necessities is actually pretty good. I no longer carry a cell phone. After realizing that we hadn’t turned on the TV for a couple of months, but were paying about $80 per month in satellite fees, we cut it off and haven’t missed it much for a couple of years. Life is slower now even though the seasons and years seem to be rushing by at an increasing pace. When I was a young executive on the fast track my greatest fear was being unemployed. Now I can’t imagine going back. Reflecting on all the people who have visited us over the years, most of them at some time said how much they aspired to this simpler, freer lifestyle. Yet such a small percentage act on those desires. I think it’s all about how we deal with fear and desire. I think most people who look into the self-sufficient lifestyle are initially motivated by fear. Unfortunately for them, it’s the same fear that keeps them from making a major change in their lives because everyone fears the unknown and big changes. Hopefully, the people who do make the change are the ones who have made the mental commitment to move toward things they desire in life and let the things they are moving away from gently recede into the background. 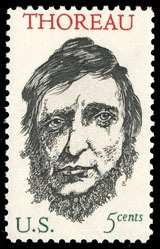 This entry was posted in Liberty, Life, Love and Wisdom, Self-Sufficiency and tagged doomsday scenario, Freedom from Fear, henry david thoreau, walden pond. Bookmark the permalink.